Can sustainability, biodiversity, and the future of the fashion coexist under one roof? EcoChic Geneva paved the way for just such a tête-à-tête this past week, with an ambitious agenda to “redefine sustainability in the international agenda.” Held at the UN’s European headquarters, the two-day event gathered policy makers, economists, fashion designers, and textile enthusiasts to explore the role fashion can play in wildlife conservation and sustainable development. Ecochic Geneva is the first of the EcoChic fashion events to hit the European continent. (Previous shows were organized in Asia by the Hong Kong-based nonprofit Green2greener.) 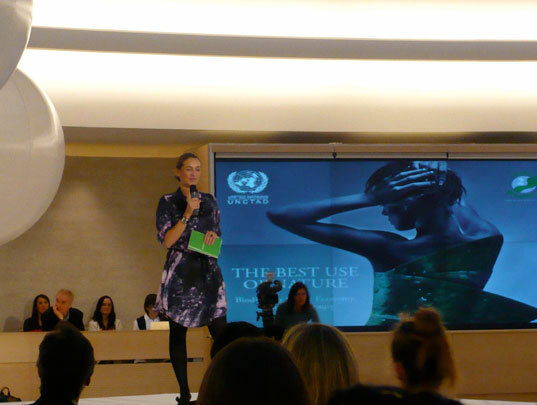 With the UN declaring 2010 the International Year of Biodiversity, it was only fitting for the fashion and luxury-goods industry to consider its relationship with the planet’s natural resources. It was time for the fashion industry to consider its relationship with the planet’s resources. Panel discussions explored a gamut of subjects, including the dearth of affordable environmentally friendly textiles, the absence of government support for students and young designers in developing nations, and the lack of consistency in sustainability standards (or even a shared vocabulary) worldwide. 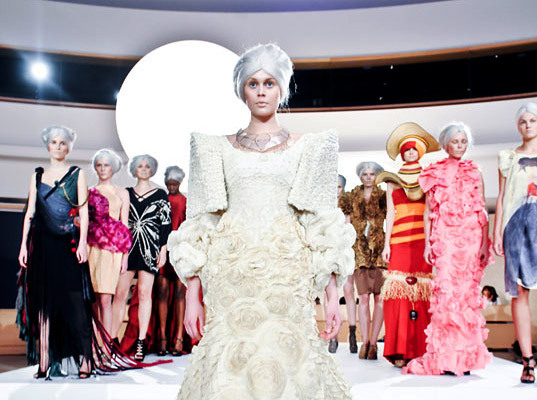 In addition to the sustainable fashion exhibition that provided a backdrop to discussions, EcoChic Geneva presented a ready-to-wear and couture eco-fashion gala that illustrated the promise of an industry that is willing to walk the talk. Bold-face names such as Summer Rayne Oakes and Kate Dillon, who also served as seminar panelists, strutted down the runway, beautifully accessorized with designers like The Andean Collection, Kumvana Gomani, and Made U.K.. The couture pieces exemplified the spirit of biodiversity by highlighting the materials’ fragility and resilience. The couture garments—unified by a palette of cream, white, red, and black—were created for the event by international designers (Diane Von Furstenberg, Thakoon, EDUN, Leila Hafzi) who were either supplied with sustainable textiles or allowed to use natural fibers from their homeland. The one-of-a-kind pieces truly exemplified the spirit of biodiversity with the vast range of fibers, textures, and artisan methods that highlighted both the materials’ fragility and resilience.